For the fictional band, see List of minor The Hitchhiker's Guide to the Galaxy characters § Hotblack_Desiato. 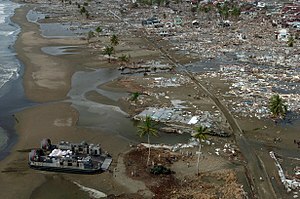 Hovercraft delivering aid to Meulaboh, on the island of Sumatra in Indonesia in the aftermath of the 2004 tsunami. A disaster area is a region or a locale, heavily damaged by either natural, technological or social hazards. Disaster areas affect the population living in the community by dramatic increase in expense, loss of energy, food and services; and finally increase the risk of disease for citizens. An area that has been struck with a natural, technological or sociological hazard that opens the affected area for national or international aid. A natural hazard is a negative process of phenomena created naturally (tornadoes, hurricanes, tsunamis, floods, earthquakes) that will affect people or the environment. Tornadoes are narrow aggressively rotating mixtures of air that come from the base of a thunderstorm, being the most violent of storms. Tornadoes are usually hard to see unless they form a condensations funnel made from:- dust, water droplets and debris. Tornadoes take place in several parts of the world, such as Australia, Europe, Africa but mostly occur in the United States, Argentina, and Bangladesh. Hurricanes, cyclones, tropical storms and typhoons can be referred to as the same. They combine low pressure and strong winds that rotate counter clockwise in the northern hemisphere and clockwise in the southern hemisphere. Tropical cyclones have a low pressure center, rain and strong winds. They usually initiate over tropical or subtropical waters. Hurricanes can be predicted several days before they hit and can be very destructive and destroy homes and some other buildings. Cyclones, although they are the same type of storm, are harder to predict before a few days like hurricanes thus giving people only a few hours of notice to evacuate their homes. In this case there are far more deaths from flooding and high tides. A recent (2012) example of a hurricane is Hurricane Sandy, which was the most devastating storm in decades hitting the United States, leaving millions without power and a few homeless. Floods take place when water overflows or submerges land that is usually parched. The most common way is when rivers or streams overflow their banks. A floodplain is produced when water from a rivers spreads through the land from excessive rain, rapid ice melting, unfortunately placed beaver dam, and ruptured dam. There are two types of floods: general and flash floods. General floods are predicted well in advance and usually cause the destruction of housing, people and crops. Flash floods come without warning and are sudden and extreme: A large volume of water flows rapidly and people have to make quick movements if they do not want to be caught in the flood. They have to find high safe ground where the water will not reach them. When two blocks of the earth suddenly slip past each other in the fault of the earth, it is called an earthquake. Energy released in many forms moves in all directions and causes the ground to shake. Sometimes earthquakes may have foreshocks, which are smaller earthquakes that occur in the same region which is followed by a larger earthquake. The larger earthquake, called the mainshock, always has aftershocks that follow it. Aftershocks can continue of hours, weeks, months and sometimes even years depending on how big the mainshock was. Earthquakes usually occur on active faults which define major tectonic plates on the Earth. 90% of the world’s earthquakes occur along plate boundaries. Earthquakes can cause much damage, mainly from the ground shaking and leaving cracks in the ground. Sometimes it can also cause buildings to collapse and cause deaths. The Fukushima I Nuclear Power Plant after the 2011 earthquake and tsunami. Reactor 1 to 4 from left to right. There are several technical hazards one should be aware of as they pose a threat humans and their values. These hazards are measured in terms of the risk they pose to the community using them. Technical hazards are classified by a source, specifically speaking; they can fall under automotive emissions, medical radiation, explosions and air pollution (environmental) hazards. The quality of the hazard determines the safety precautions that are taken. For example, hazards can be a risk to an individual or a risk to the population. If the population is at risk with the hazard, there will be more priorities for the management of the hazardous material. These hazardous materials can cause illness or even death to an individual if they are not address accordingly, so it is crucial for them to inform the public about these technical hazards. Nuclear accidents are not deliberate and viewed as acts of nature. There are several examples of these nuclear accidents taken place around the world. To start off, a prime example of a nuclear accident would be Palo mares B-52 Accident. On January 17, 1966, a U.S. Air Force B-52 bomber collided with a mid-tanker airplane that was being refueled at 31000 feet. When the two airplanes collided, the tanker airplane exploded completely killing all crew members, while the B-52 bomber split in half killing a small proportion of the crew. When the airplane split in half, four bombs dropped from the sky. Two of them detonated, causing 2 kilometers of land to be contaminated by radioactive plutonium. The fourth explosive was recovered when it was discovered that it landed on the sea. The soil on the contaminated area had to be removed and placed in barrels, to reduce the amount of pollution having been caused by the nuclear explosive. Nuclear incidents are causes that include deliberate actions but these are “generally non-malicious and non-violent; may be due to poor judgement [or] wrong information.”  A Secondary example would be the Johnston Atoll Incident that occurred on July 25, 1962. They decided to conduct the experiment at Christmas Island on Johnson Atoll, where they set off 36 nuclear explosions. One of the missile launches went wrong as it malfunctioned when trying to launch. The leaders decided to detonate the missile before it launched. When it detonated, the entire island was covered with radioactive plutonium. The witnesses claimed that 85% of the people suffered from radioactive contamination that created cancer and other radioactive related diseases. Plus those who were present at the site of the explosion suffered from infertility, and other body deformations. Sociological hazards that create a disaster area are riots, terrorism, and war. A riot is defined as a noisy, violent public disturbance caused by a group or a crowd (three or more people) usually protesting against another group or government policy in the streets. The UK London riot in August 2011, for example, was started due to the shooting of Mark Duggan by the London police. The rioters came together destroying neighborhoods and streets violently damaging property to protest the police's actions that happened a few days prior. Riots increase expenses to repair costly damages putting the city in distress. Twin Towers burning down during the 9/11 attacks. Terrorism is defined as acts of violence and threats by a group against people or property with the intention of intimidating or coercing societies or governments, often for ideological or political reasons. Terrorism occurs with an unexpected attack on non-combatants to create fear and panic having a detrimental consequence. Terrorist attacks create a massive, costly impact on the society. Not only is there large amount of property damage that may not be able to be repaired, there is also a large impact on citizens. People lose loved ones and suffer from their own health being impacted. The 9/11 terrorist attack on the twin towers in New York City marks one of the largest attacks on the United States. 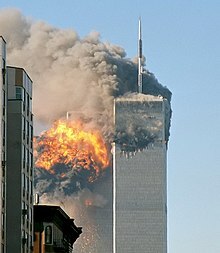 The Twin Towers were completely destroyed, damaging the surrounding buildings as well as causing the loss of many lives. People suffered from health problems from inhaling the sediments from the crumbling towers. The financial and social impact is still present thirteen years later in today's society. It is concluded that New York City still suffers from a post-disaster decline in financial services. New York City is a Disaster area due to the sociological hazard of terrorism. War defined as a period where conflict is carried out as an act of hostility by armed forces between two or more nations or within a nation. Afghanistan, for example would be a sociological hazard causing disaster areas because it is considered a war zone. There has been an ongoing battle between United States and the Taliban in Afghanistan resulting in a war zone. Constant bombing and shooting marks up Afghanistan destructing property, land and causing threats to the civilians living in the area. Thousands have died and international aid for the cost of the war is implemented through tax payers. There is lack of resources due to the war area cutting off access to areas because of violence and danger. A recent example of a disaster area caused by a natural hazard is Hurricane Sandy which hit October 27, 2012. It was the most devastating storm in decades hitting the United States. The storm killed about 50 people and many were also hit by falling trees. The hardest-hit state was New York, leaving millions without power and a few homeless. A disaster area caused by a sociological hazard would be the terrorist attack on September 11th, 2001, in New York City. Two airplanes struck the Twin Towers, causing them to crumble, killing many people in the process. The unexpected attack harmed many people and had a detrimental impact on New York City. ^ "Geography vocabulary: Gcse farming". www.geographyfieldwork.com. February 2012. ^ "NSSL: Severe Weather 101: Tornadoes. NOAA's National Severe Storms Laboratory". Retrieved November 5, 2012. ^ "Sandy death toll rises, millions without power in u.s". The Associated Press. October 30, 2012 – via CBC News. ^ "Floods". IFRC. November 5, 2012. ^ "Flood Information, Flooding Facts, Flash Floods, Photos -- National Geographic. Environment Facts, Environment Science, Global Warming, Natural Disasters, Ecosystems, Green Living". National Geographic. November 5, 2012. ^ a b "Seismic Sources – Earthquakes, Nuclear Blasts, Mining Events". Canada's Natural Resources. 2011. Retrieved November 5, 2012. ^ Simon, S. (2011). "Introduction to Nuclear/ Radiation Accidents, Incidents and Events. Radiation Epidemiology and Dosimetry course" (PDF). Archived from the original (PDF) on 2012-03-06. Retrieved 2012-11-06. ^ "Riot - Encyclopædia Britannica, Inc". www.dictionary.com. Retrieved November 1, 2012. ^ a b Fuchs, C. (2012). "Behind the News: Social Media, Riots and Revolution. Capital and Class, 36(3), 383-391". Capital & Class. 36 (3): 383–391. doi:10.1177/0309816812453613. Retrieved November 1, 2012. ^ "terrorism" – via The Free Dictionary. ^ "Terrorism. The American Heritage: New Dictionary of Cultural Literacy, Third Edition". www.dictionary.com. November 5, 2012. ^ a b c Gong, H.; Keenan, K. (2012). "The Impact of 9/11 on the Geography of Financial Services in New York. The Professional Geographer, 64(3), 370-388". Retrieved November 4, 2012. ^ war. CollinsDictionary.com. Collins English Dictionary - Complete & Unabridged 11th Edition. Retrieved November 12, 2012. ^ a b c Boettcher, M. (2011). "They were Hunting and Killing Us: Abc News' Mike Boettcher Caught in Taliban Firefight with U.S. Troops in Afghanistan". ABC News. ^ a b c "Worst Nuclear Accidents / Disasters in History". www.smashinglists.com. 2011. Retrieved November 5, 2012. ^ a b Masud, E. (2006). "What Really Happened on September 11 Remains a Mystery". The Wisdom Fund. Retrieved November 5, 2012.